From the beaches to the cities, California has some really good Bloody Marys. From elegant brunches, to happy hours and beyond, California’s range of Bloody Marys are available as classic cocktails, build-it-yourself hangover cures, and even full out snacks. The Tadich Grill is the oldest restaurant in the state, and one of the oldest in the country. 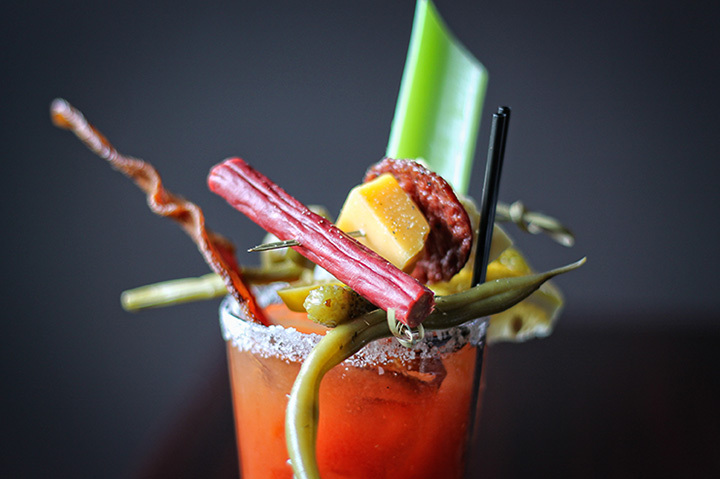 So you know that they’ve had plenty of time to perfect their Bloody Mary. Classic like the rest of the old-school joint, you can ask for it spicy but it comes no frills, perfect for pairing with your choice of fresh seafood. The Salted Pig is a rare treat in the Inland Empire. The gastropub makes their own Bloody Mary mix and it’s worth a stop, whether you’re a local or just passing through on your way to a bigger city. The Attic has earned a reputation for its Bloody Marys. Sure, you can get a classic, but you can also get a slider on the toothpick that floats above your drink—an option that is so popular, it has its own emoji. Other toppings include bacon or ribs. The Elixir in San Francisco is a cozy corner bar but it also has a big reputation for serving some of the best drinks in the country. Including the famous “vodka salad bar” available every Sunday. The build your own Bloody Mary bar is amongst the best you’ll ever find. Cliff House is known for its classic Bloody Marys. And now you can bring home a bottle of the mix or you can relax and have the real thing. It’s the perfect drink for staving off hunger as you wait for a brunch table and gaze out at the view. Downtown LA is going through a revitalization but La Cita is a mainstay in the neighborhood. By night, it’s a packed nightclub. But Sunday afternoons it transforms into a full-scale Bloody Mary bar—with micheladas as well. Top it off with a shrimp cocktail or keep it simple with celery—you know how you like it best. Cole’s argues for the title of the city’s original French dip, but it is also a contender for best Bloody Mary. Using pickle juice and other in-house ingredients like spices and meat rub, the mix marinates for 24 hours and is freshly made each week—just in time for Sunday brunch. Located inside the Fairmont Miramar Hotel in Santa Monica, Fig has a Bloody Mary that is often noted as one of the best in the city. The farm-to-table restaurant has its own secret recipe for the perfect blend, which pairs perfectly with the nearby Pacific. Since 1994, The Ramos House Café has been serving food from its historic digs in a renovated house. The Bloody Mary’s make a perfect accompaniment to brunch but are really more of an appetizer in their own right, made with soju and stacked with a crab claw and quail scotch egg. The seafood-centric spot only has one location left but you can still score a “Maryland Mary.” Topped with seafood, you can add an oyster or shrimp to the crab and spiced rim that is served with pickled veggies and pairs with other seafood items on the menu—for lunch or any other time of day. View more California Bars and Saloons.